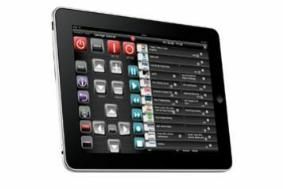 UPDATE: RedEye's new software adds remote features and iPad version | What Hi-Fi? Available as a free download from the iTunes App Store, v2.0 adds a dedicated iPad version with improved layout and graphics for the larger screen, and a range of enhancements for the basic package. These include the ability to edit activity layouts using a computer, keyboard shortcuts when controlling the Wi-Fi version from a PC, customisable signal repeat counts, and improvements to the connectivity set-up and channel guide downloads. Channel guides are currently available in the USA, but will be coming soon to the UK. The ThinkFlood RedEye remote control, which can turn an iPod Touch or iPhone into a universal remote handset, is about to hit UK shops. We first covered the RedEye system back in May, when we received a sample from the US manufacturer – now both it and the little RedEye Mini device are about to go on sale in UK, following the appointment of Armour Home as exclusive UK distributor. The RedEye, which will sell for £200, combines a charging dock/remote sender connected to a home Wi-Fi network with an iPhone/iPod Touch app. It can be programmed to control individual devices or a complete system, either with single commands or a whole chain to create macros, and can be expanded into multiroom control. Operation screens are completely customisable, and it's possible to add new commands or components when required. The smaller RedEye Mini is run by the same app, but takes the form of a tiny unit which plugs into the headphone socket of an iPhone or iPod Touch. It will sell for £50.